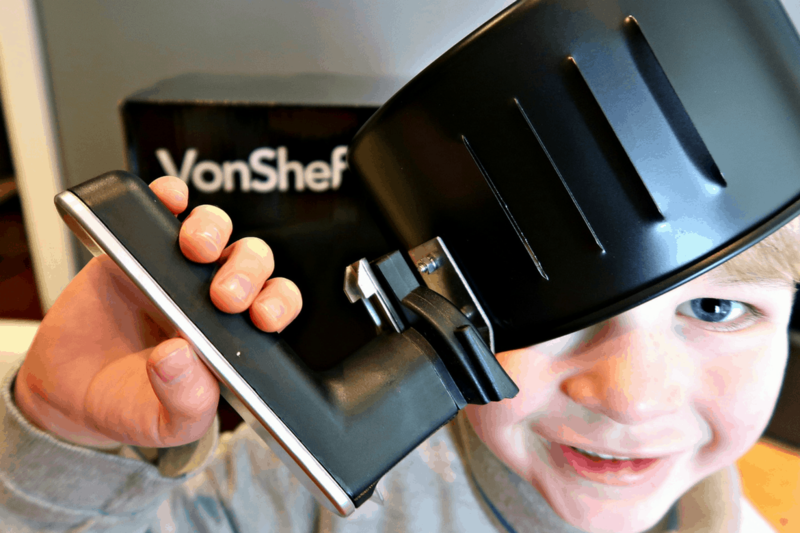 Why buy a VonShef air fryer? The VonShef counter top air fryer is a digital kitchen appliance that cooks by rapidly circulating hot air around the food at high speed. As a healthy alternative to cook foods like chips, chicken, fish, steak, pastries (and more) it uses 80% less oil than a traditional cooking methods. Because chips are so popular, they are responsible for Britons consuming 240,000 kilos of hidden fat every year! No more concerns about trans fats and saturated fats. The non-stick coating ensures an easy clean, you don’t have to deal with grease stained cookware! As a multi-functional fryer you can fry, bake, roast and reheat all quicker and faster than in a conventional oven. Air fryers are attractive for their convenience, safety, and health benefits. Sleeker in design and dimension than a deep fat fryer or oven, the Vonshef boasts a generous 2.5 litre capacity sufficient to make dishes for a family and for batch cooking. It is a simple, effective product. The fryer is classic black with a high shine finish offers contemporary style. It offers non slip feet and a cool touch handle offers extra safety whilst in operation. When not in use, the air fryer benefits from a concealed power cord storage feature, easy for storage and ideal to keep wires away from little hands that may pull at them. The VonShef air fryer is good value compared to competitors on the market and at £52.99 similar in price to my toaster! Why not try this easy to whip up, family friendly Vegan meal? Mushroom rice with asparagus alongside potato and kale nuggets is a cheap and easy to make meal full of tasty goodness and simple flavours. Preparation time 5 minutes, cook time 10 minutes. Serves 3, depending on portion size. Start your rice to boil first. Mix together the vinegar, soy, syrup, garlic and 5 spice in a separate bowl and set aside. Place the mushrooms and onion in the air fryer. Cook for 10 minutes. Pull out the pot and shake. Pour the liquid mixture and peas over the top of the mushrooms. Stir and cook 5 more minutes. Add the mushroom/pea sauce to the rice and stir. Serve. Add air fried asparagus to the dish. Simply trim, spray with a little vegetable oil and season. Cook time 10 minutes. Serve. Preparation time 20 minutes, cook time 20 minutes. Cook the potatoes in a large saucepan of boiling water until tender, about 20 minutes. In a large pan, sauté the garlic. Add the kale and sauté for 2 to 3 minutes. Drain the potatoes and add the aquafaba, salt, and pepper. Preheat the air fryer to 390F. Mash the potatoes. Add the kale and garlic. Roll the potato and kale mixture into 1-inch nuggets. Spritz the air fryer basket with oil. Place the nuggets in the air fryer and cook for 15 minutes, until golden brown, shaking the basket halfway. Voila! An easy make family meal with minimal washing up. Have you ever used an AirFryer? Or do you have any Vegan recipes you enjoy?